This coach house of a castle in Berbroek, Herk-de-Stad, was used to store carriages. As such, the interiors needed to be restored before it was treated. The coach house has 3 types of flooring; red terracotta, yellow terracotta, and brick paving. Miranda from Sealer.bvba was contracted to restore the floors that were covered in grout haze, mortar mess, and paint. They were then asked to seal and enrich the colors of the floors. Read the full case study on our website or download the pdf. The world is filled with fascinating stone structures and buildings, all beautiful examples of the craftsmanship and architecture of that time period as well as the tools and other resources available. Among these architectural wonders there are some that are in ruins, some are still standing, and some are even still in use. One of the world’s oldest structures is the Megalithic Temples of Malta. 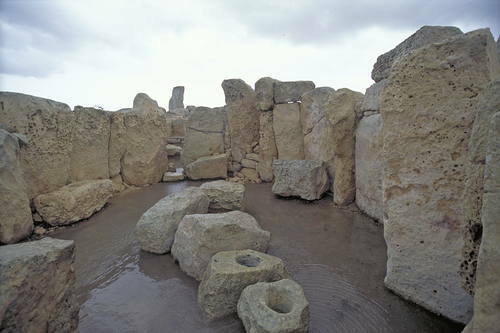 According to the United Nations Educational, Scientific, and Cultural Organization (UNESCO), “the Megalithic Temples of Malta (Ggantija, Hagar Qim, Mnajdra, Skorba, Ta Hagrat and Tarxien) are prehistoric monumental buildings constructed during the 4th millennium BC and 3rd millennium BC”. They are among some of the earliest free-standing stone buildings in the world and stand out for their diversity of form and decoration. UNESCO goes on to say that “each complex is a unique architectural masterpiece and a witness to an exceptional prehistoric culture renowned for its remarkable architectural, artistic and technological achievements”. To learn more about the Megalithic Temples of Malta and the different plans, articulation, and construction techniques used for each temple click here. Join us in the World of Concrete Pavillion at The Buildings Show in Toronto, Canada.